In another universe, I don't own Apple Watch. Either LG Watch Urbane or Moto 360 adorns my wrist. But in this one, I not only sold my soul to the bitten-fruit logo company but I grew to enjoy the servitude. Thirty-three days after purchasing the smartwatch, I can express satisfaction, even if sometimes muted, with the user experience. I prefer Android Wear for its fantastic contextual utility, but find greater overall usability and positive emotional response from living with Apple Watch. As expressed in the previous post, I suspect that returns rates may be high for this device—at least compared to others that Apple produces. The real measure of any product's success is: 1) Did you keep it? ; 2) Do you use it? ; 3) Do you enjoy it? 1. Feels and looks good on the wrist. This attribute applies to the stainless steel Apple Watch more than the aluminum Sport. The shinier finish and subtle changes in detail make for classier wristwear. Round has always been my preferred timepiece shape but I grew to appreciate the rectangle within just a few days. Here's the thing: I enjoy looking at my wrist to check the time or notifications. Sometimes, I flip my wrist just to gawk. Appearance is a user benefit Apple gets that too many gadget makers don't. 2. The OS user interface. It's pretty and surprisingly functional, despite unnecessary dependence on crown and button. All interaction should take place on the screen, which is highly responsive to touch. Accuracy matters when tapping numbers for password or tiny app icons. 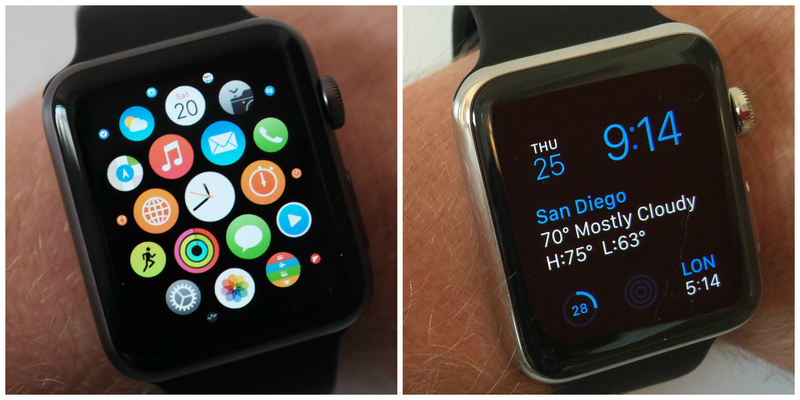 Here's the thing: I enjoy interacting with watchOS compared to Android Wear, for esthetic and functional reasons. In my early Apple Watch assessment, I balked about too many prompts to view or taps to make. But over longer period using the device, the UI's utility makes more sense and more sweetly satisfies. Stated differently: Benefits balance, an attribute's importance I already explained in context of iPhone 6. But UI is bigger than the device, which is where the wristwear stumbles. On Android timepieces, Google's contextual cloud proactively provides information without your asking. For example: Looking at the time and seeing a Google Now notice informing the minutes to drive home. Apple's excellent UI experience is too bound to the device, something watchOS 2 promises to remedy—at least in part. 3. Text messaging. There is nothing remarkable about Apple Watch's ability to receive and send texts. Other smartwatches do this, too. In my early assessment, I found the utility cumbersome compared to Android Wear, seeing swiping action as better UI implementation. But over time, I find Apple's presentation to be better and more responsive to user interaction. I spend less time messing around with texts, which is valuable if responding in the car at a stoplight or in the presence of someone else. Meaning: minimized disruption, in part because of UI utility on the rectangular screen, canned responses to send, and overall responsiveness to touch (the persistent lag I experienced on both the 360 and Urbane is missing). Voice responsiveness. for responding to texts, and for anything else, is more accurate than either of the Android Wear timepieces, too. I rarely experience what was frequent on either: Say one thing, but something else sends because speech-to-text messaging is inaccurate. 4. Phone calling. I feel like a total geek talking to my wrist. But, goddamn, if this feature isn't beneficial. I don't use a Bluetooth earpiece, in part because constantly wearing one strikes me as rude and the thang looks nerdy. But I will answer a call on my watch, say, while driving. Glancing briefly at my wrist and tapping to respond keeps my eyes and hands in the plane where they already are. Last week, while giving the cat some outdoor time in our apartment building's center courtyard, my sister rang. But, whoa, the phone was upstairs, and presumably out of Bluetooth range, in my office on the charger. I was surprised to see the phone call coming in over Apple Watch, but answered and we chatted for about 10 minutes. Something else: It's very convenient to dismiss a call from the wrist. I don't have to fumble for the phone, which can disrupt the communication with the person with whom I am present. Tapping the watch to dismiss a call also communicates something to the living being right there: You matter more, which means something in this age of smartphone obsession and distraction. 5. Haptic alerts. Frak, if the tactile response isn't beneficial, if at times distracting. The most surprising lesson came recently while using Apple Maps to pick up moving boxes for my daughter. I accessed the app on iPhone 6, but also got that little tremble from the watch when time to turn came. The feature offers many other benefits, some subtle. For example, days ago I finally set up some of the HealthKit features. Now, every so often, Apple Watch prompts me to stand up, using pleasing but fairly quiet pop-chime and tremble to the wrist. Stated differently: Haptics prompt you without necessarily alerting or disturbing other people around you. That goes to a much deeper design ethic that is pervasive throughout the UI and UX: Alert your attention with minimal disruption to you and other people with whom you are present. This philosophy also reduces how often iPhone distracts you from things or persons with which you are engaged with there and then. Rather than pull out the smartphone, you feel the timepiece's haptics and respond with the taptics; quickly and quietly. What's the 1960s song lyric? "Love the one you're with". Haptics in context of the entire UI design ethic is: "Be with the one you're with". And finally...I miss Apple Watch when it's not on my wrist, which says much about the overall benefits. That said, expect a future post explaining what I don't like about the smart timepiece. There you may learn why apps, social sharing, and some other highly-marketed features don't make this list.